We consider Ryan to be our miracle baby. After four years of marriage and many prayers lifted to God we finally became pregnant with our one and only child Ryan Hunter. I had a normal pregnancy with no sign of any health issues to Ryan or myself. In April we knew Ryan would be here soon but we did not realize just how soon. Ryan’s due date was the second week of May but he decided to make his entrance into the world six weeks premature. So without any bags packed we ended up at Mary Chiles’s Hospital. We were thinking I had Braxton Hicks only to find out that my doctor, calm but concerned, couldn’t stop labor. She requested that I was rushed to University of Kentucky Hospital (UK) in Lexington, Kentucky. Ryan was born on the morning of April third, two-thousand and seven. He weighed six pounds and one ounce. I remember when I started labor there were only three people in the room. When Ryan was delivered there was a team of nurses and doctors there to check on my newborn, premature baby. Exhausted from labor, I held Ryan in my arms for a few moments taking it all in and then they took him. I woke up some time later to an empty delivery room. Both Ryan and my husband, Farley were gone. I later learned that it is not standard practice to check the blood sugar of a newborn baby but due to the fact that Ryan had made his arrival six weeks premature, they checked his sugar by finger stick. His sugar reading was 13! The lab reading came back at 3! Ryan was immediately rushed out of the delivery room and straight into Neonatal Intensive Care Unit (NICU). The next couple of days are somewhat unclear to me. I remember realizing that not only had Ryan came into this world premature but he was battling to keep his blood sugar in a normal range. I had never heard of some of the medical terminology that nurses and doctors around me were using. We (Farley and I) knew that something was wrong and that the doctors were researching to figure it out for themselves. During Ryan’s stay in NICU his little feet became bruised from multiple blood sugar checks. He had a feeding tube down his nose and a constant Dextrose IV helping to maintain blood sugar levels. The first few days were spent trying to bond with our newborn while inside we were both exhausted, terrified of the unknowns and wondering what the future held for this child we had so desperately prayed to receive. A few days later I remember sitting in a room with Farley waiting for a doctor to come speak with us. We did not have a clue what he might say to us. It was a frightening experience that has been forever impressed in my memory. Ryan’s doctor explained that he had reached out to speak with the Children’s Hospital of Philadelphia Hyperinsulinism unit. This was the first time we had even heard the word Hyperinsulinism. Once Ryan’s doctor had this diagnoses they were able to ween Ryan off of his feeding tube and the IV Dextrose and start him on Diazoxide. Ryan remained in the hospital for a total of seven days. We left with a diagnoses of Congenital Hyperinsulinism (CHI). I remember packing up to leave from the hospital with Ryan; the NICU nurses giving us training on checking blood sugar levels, administering medicines, and watching for signs of Hypoglycemia (low blood sugar). We were so excited to finally be going home with Ryan however, we were overwhelmed with our new reality of life being much different than we had ever imagined. I will admit that I was absolutely terrified of the “what ifs” and especially the unknowns to this new life we now faced. 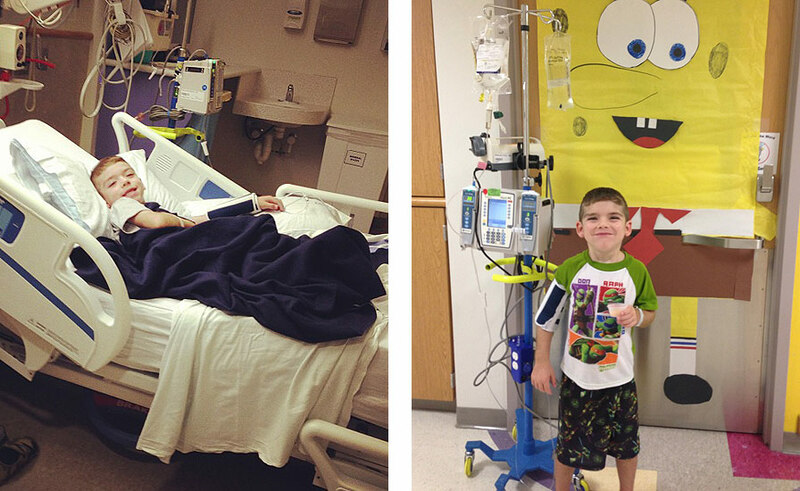 The first year of Ryan’s life he was hospitalized over twelve times. Most of those hospital stays lasted at least two weeks or longer. Ryan’s sugar would drop from seventy to eighty range low into the fifties, forties and many times in the twenty to thirty range on a daily basis. Ryan also experienced, what doctor’s believed to be at the time, seizures. I will never forget rushing to the hospital late one night and ending up being pushed back from Ryan’s hospital bed while a large crowd of doctors and nurses surrounded our son working to save his life. We left that hospital stay with appointments to see a Neurologist, a Cardiologist and a Genetics Specialist. Soon after that, Ryan had his first heart catheterization. He was only three months old. He had developed Hypertrophic Cardiomyopathy and fluid around his heart. This time we left the hospital with around eight medications and a medication schedule that would require us to give him medicine about every two hours! The next six years of Ryan’s life consisted of many doctors’ appointments, medication changes and a few more hospital stays. These years were a battle of constant low blood sugars and so many unanswered questions about Hyperinsulinism. When Ryan was 6 years old we made a trip to the Children’s Hospital of Philadelphia (CHOP) Hyperinsulinism unit. This was a wonderful life changing experience for all of us. This trip brought new light into his diagnosis. During Ryan’s three week stay at CHOP a full evaluation of Ryan’s Hyperinsulinism was finally completed. They removed all his medications, performed blood tests, fasting tests, and a PET scan. This was the first time in six years that we knew without any doubt that Ryan had Diazoxide-responsive Diffuse Congenital Hyperinsulinism. Not only did we discover that it was Ryan’s entire pancreas affected but we also learned about Congenital Hyperinsulinism International. We had the opportunity to meet another family with this rare diagnosis and for the first time felt like there were others who understood our journey with Hyperinsulinism. We left CHOP with a better understanding of not only Hyperinsulinism but more specifically Ryan’s Hyperinsulinism. Ryan also left behind five years of daily Octreotide injections. Since Ryan’s stay at CHOP his blood sugars stay mainly in normal range with the help of Diazoxide. He has had no issues with seizures since he was a baby. We really feel that he was never having seizures but more likely trouble with his heart – from the impression given by doctors. He had another heart catheterization on January 2016 (just before his 9th birthday) when his Cardiologist believed he might have had Pulmonary Hypertension. However, the heart catheterization proved otherwise, Praise God! Ryan is still followed by Cardiology for a small leaking valve. Today Ryan is an active (almost ten-year-old) who loves playing basketball. We have been so encouraged by the stories we have discovered of others who share Ryan’s same diagnosis. We know we do not have all the answers about Ryan’s condition but we are thankful for how far he has come and the possibilities for research discoveries that will hopefully help Ryan and others to live a full life.